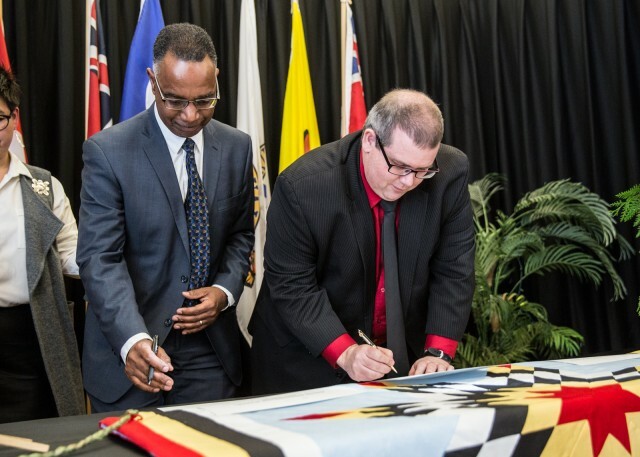 Brandon University President Gervan Fearon, left, joined Assiniboine Community College President Mark Frison, on Friday, Dec. 18, 2015, as they and other post-secondary education leaders in Manitoba signed the Indigenous Education Blueprint. BRANDON, Man. ­­– Manitoba has taken a major step in efforts to become a global leader in Indigenous education. 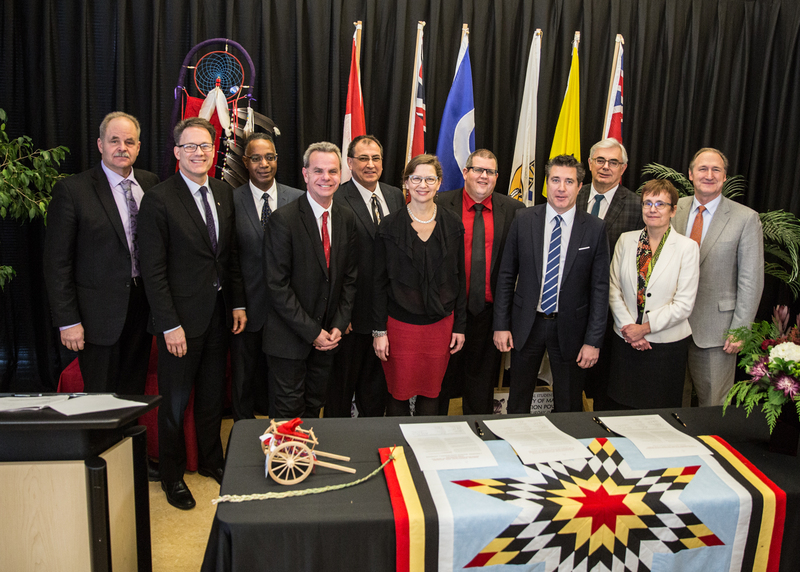 Brandon University (BU) joined the province’s other post-secondary institutions and Manitoba’s school boards today to sign the Indigenous Education Blueprint (IEB). This agreement affirms their shared commitment to promoting and advancing Indigenous education, while supporting the reconciliation between Indigenous and non-Indigenous people in Manitoba. The next steps will be for the partners to establish a steering committee that will prepare an implementation plan as they work toward the blueprint’s 10 objectives. Read the full IEB. Post-secondary education leaders in Manitoba signed the Indigenous Education Blueprint, committing their institutions to enhancing Aboriginal education. Joining BU at Migizii Agamik – Bald Eagle Lodge in Winnipeg to sign the document were Assiniboine Community College, Canadian Mennonite University, the Manitoba Institute of Trades and Technology, Red River College, University College of the North, Université de Saint-Boniface, the University of Manitoba, University of Winnipeg and the Manitoba School Boards Association. “The Indigenous Education Blueprint was inspired by the Calls to Action from the Truth and Reconciliation Commission,” said President Gervan Fearon, who signed the document on behalf of BU. The ceremony also included an address by BU Aboriginal Student Council (BUASC) President Adrienne Thomas, who spoke to the group about the importance of this initiative from an Indigenous student perspective. The goals of the IEB are consistent with those of BU’s Academic Plan, which was developed in 2014. Indigenous education has been a priority at BU for decades. BU launched the Program for the Education of Native Teachers (PENT) in 1971, and four years later became the first university in Western Canada, and only the second nationwide, to introduce a Native Studies Department. The university has also developed a Department of Visual and Aboriginal Art, built the He Oyate Tawapi ceremonial room and opened the Indigenous Peoples Centre to support students educationally and socially. More on BU’s Indigenous engagement can be found at brandonu.ca/indigenous.